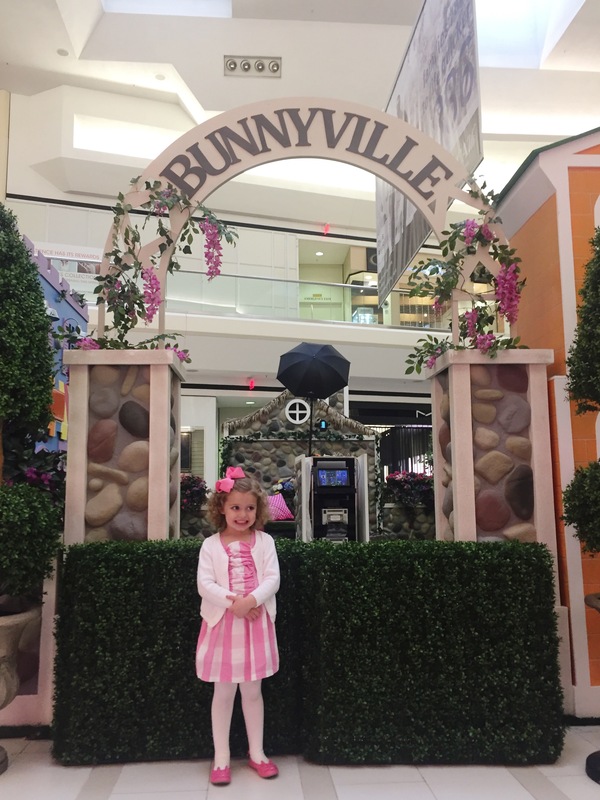 Bunnyville at Fair Oaks Mall is now open! 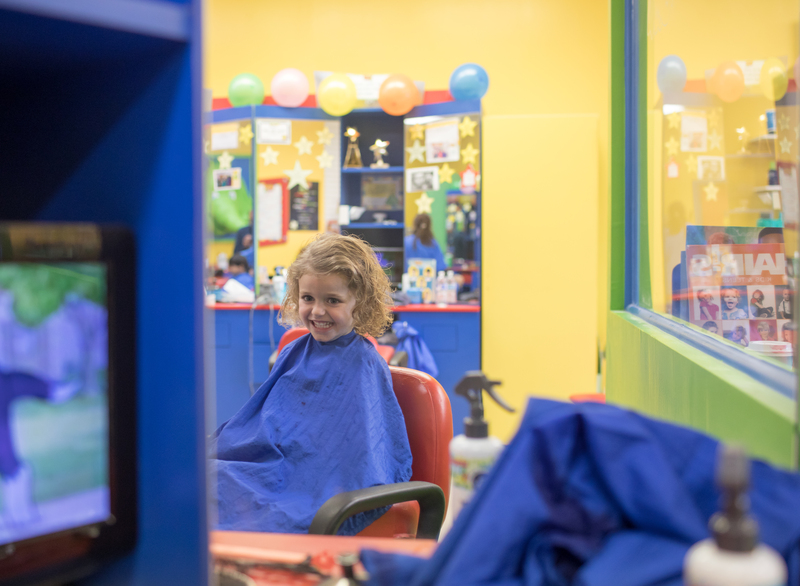 I took my littlest to the grand opening last week and it was such a fun experience! Now she’s talking about Easter everyday and is just so excited about celebrating the holiday! 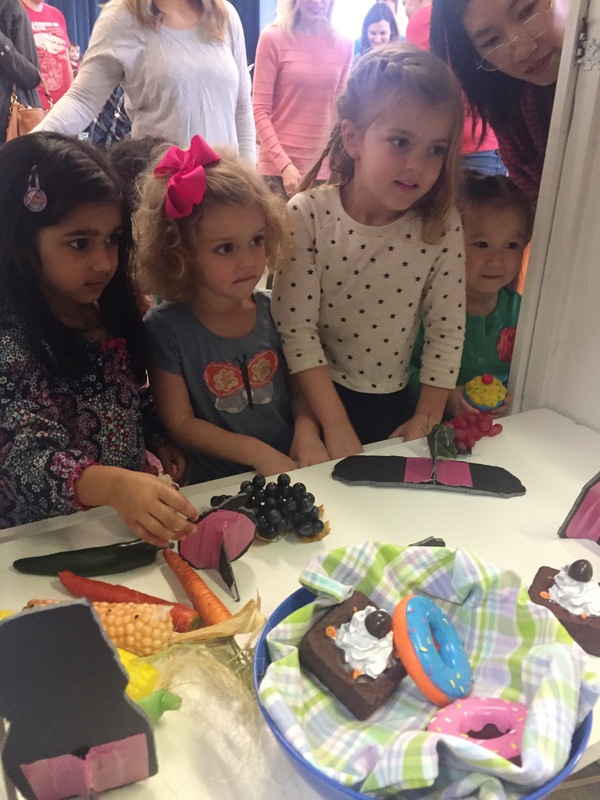 Now through April 15th, the Easter Bunny will greet visitors in Bunnyville — a three-dimensional town for kids to explore. 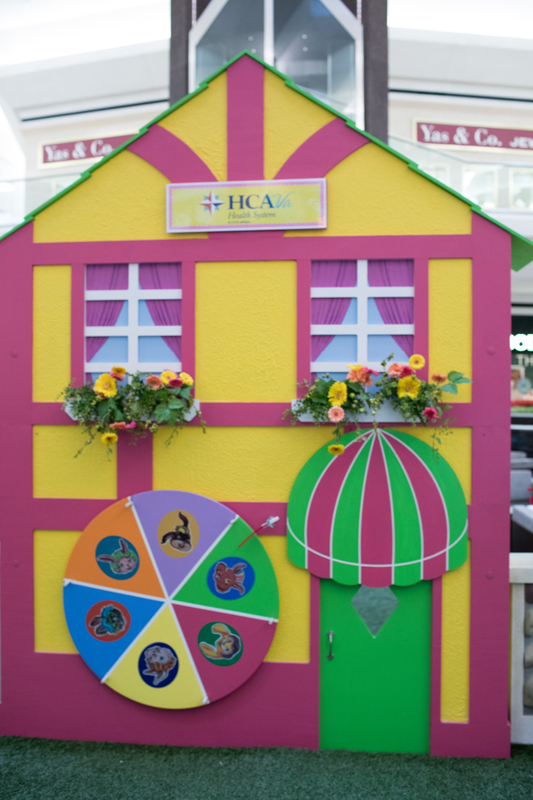 Located on the shopping center’s lower level in Grand Court West, Bunnyville features many places to visit including Hoppin’ Fresh Bakery, Hare Salon and 24 Carrot Bank. 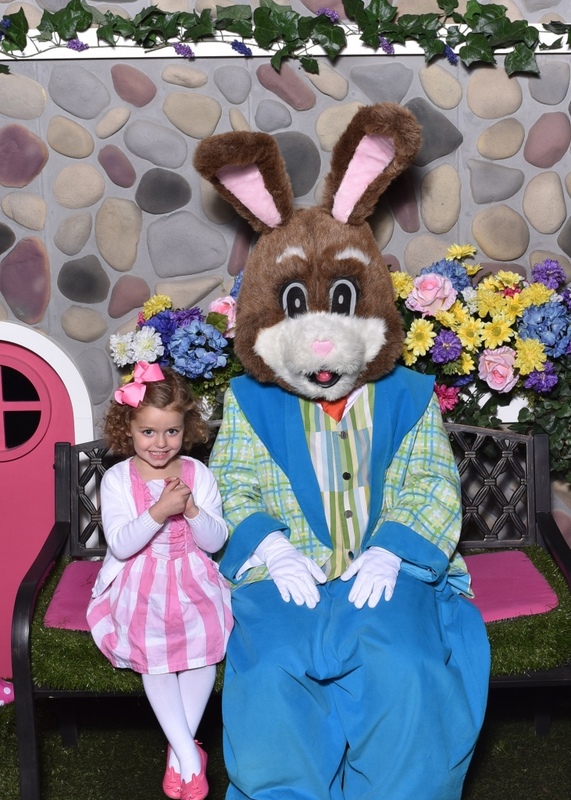 The last stop along the adventure is an opportunity to visit with the Easter Bunny and have photos taken. Those who visit the Easter Bunny will receive a complimentary gift (while supplies last). This special family-friendly holiday experience is being offered exclusively at Fair Oaks from March 24th through April 15th. This annual event is free for the public to attend. Photo packages may be purchased onsite. 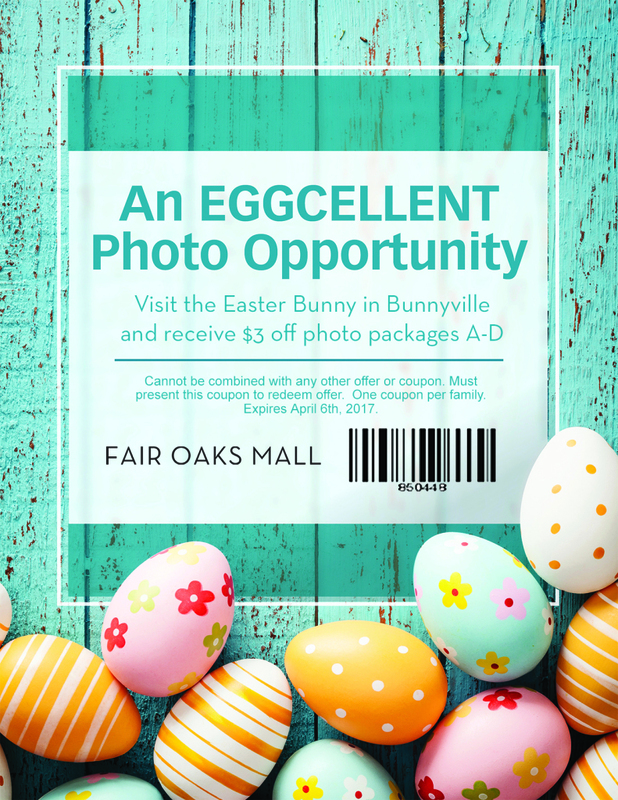 For more information visit http://www.shopfairoaksmall.com/events. Monday through Saturday: 10 a.m. to 8:30 p.m.
Use this coupon to get $3 off a photo package. You can get printed photos as well as the digital copies sent right to your phone! 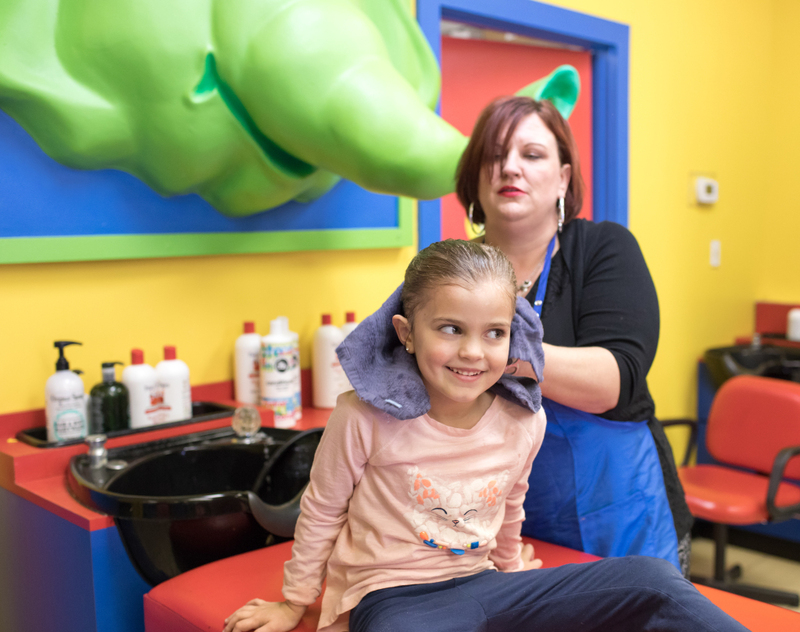 Spring Haircuts at Cartoon Cuts + GIVEAWAY! Spring is finally here! The days are getting brighter, the birds are chirping, and flowers are starting to bloom! 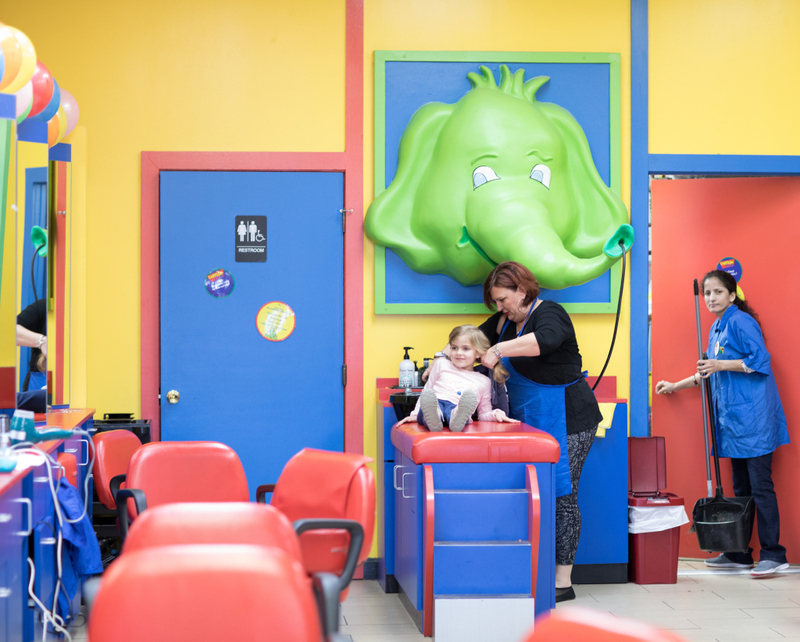 I decided this week was the perfect time to take my girls into our favorite Cartoon Cuts for fresh spring haircuts. We always visit the location at Congressional Plaza in Rockville. My girls are comfortable there and the staff is so friendly. When we walked into the store we were immediately greeted by the woman at the front desk and the manager, Melissa. 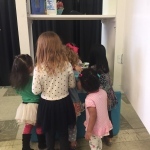 As my girls were playing with the toys in the waiting area, Melissa starting chatting with them and they quickly became excited for their turn to get their haircut. She had such a nice demeanor and a way of making my girls feel comfortable. 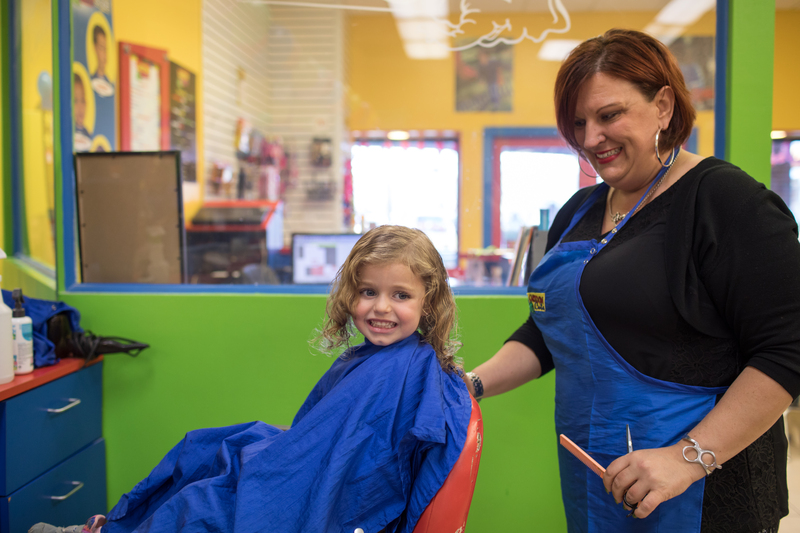 If your little ones have haircut anxiety, you can rest assured that you are in good hands with Melissa and her staff at Cartoon Cuts! Clara went first with getting her hair washed and loved how the trunk of Ellie the elephant was spraying her hair! 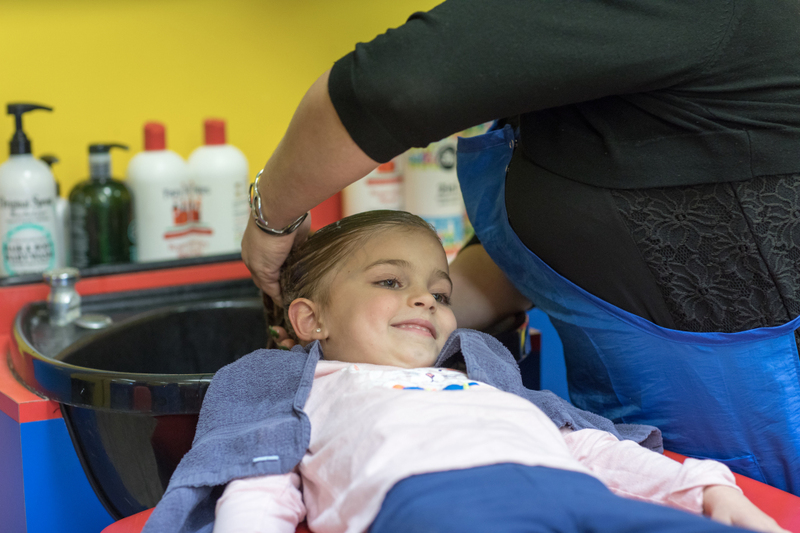 My littlest, Mae was nervous about getting her hair washed. Melissa was so great with her, she didn’t pressure her and decided it would be best to just wet her hair with the spray bottle. As you can see, Clara was thrilled with her new haircut! 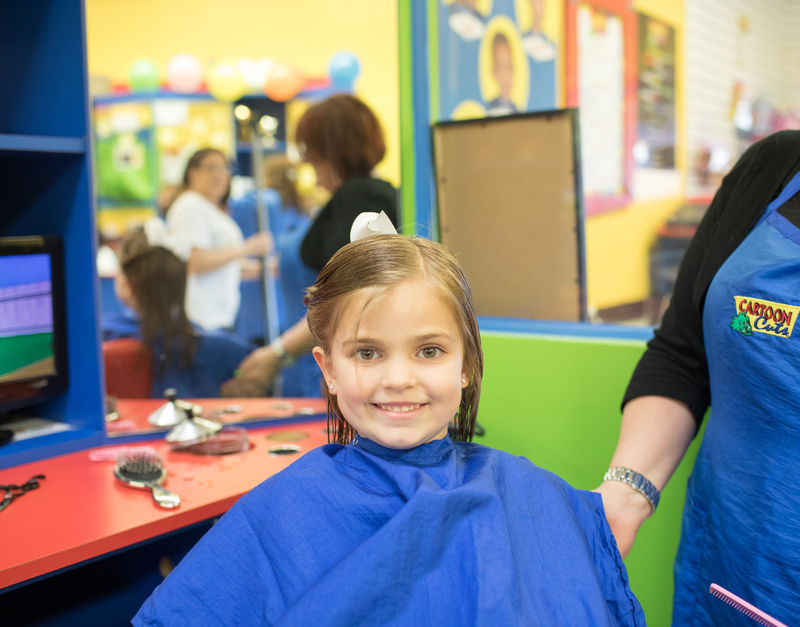 At first she was hesitant to cut it because she liked the length but the ends had gotten dry after taking swimming lessons all winter. The fresh cut was definitely needed and she was happy that she still had the length to her hair after the trim. And Melissa did a cute little braid around the side that she loved! Next up was Mae! 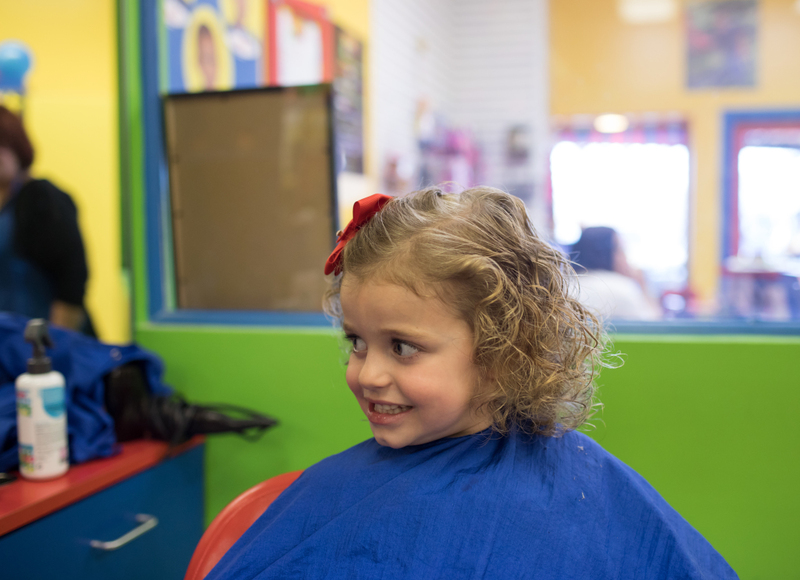 She was blessed with a head full of curls but it definitely requires someone who knows how to cut curly hair. Melissa did an amazing job! She trimmed the ends and added some layers to make her curls really bounce! Mae was very happy with the result! 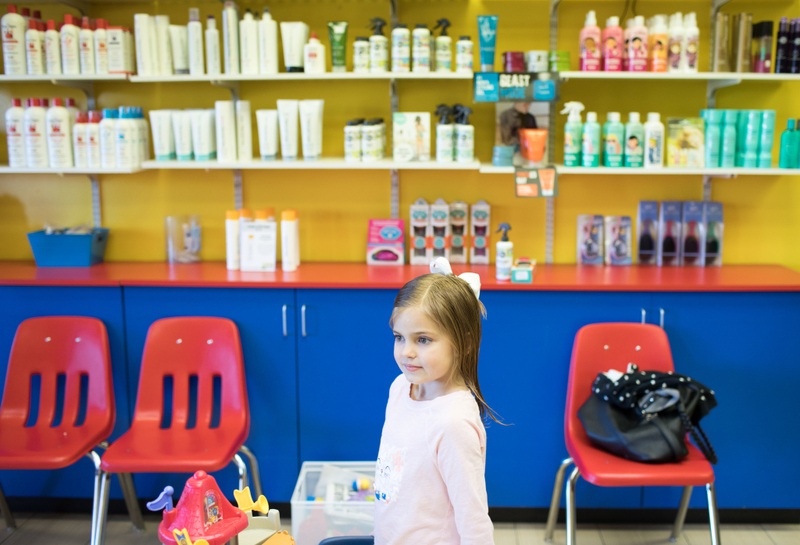 The salon carries a lot of great products specially designed for kids hair. We bought the Knot Genie brush and the SoCozy detangler and I LOVE them! I’m not trying to sell these products or anything, just sharing what is working well for me on the hair brushing battle every morning! (GIVEAWAY!) 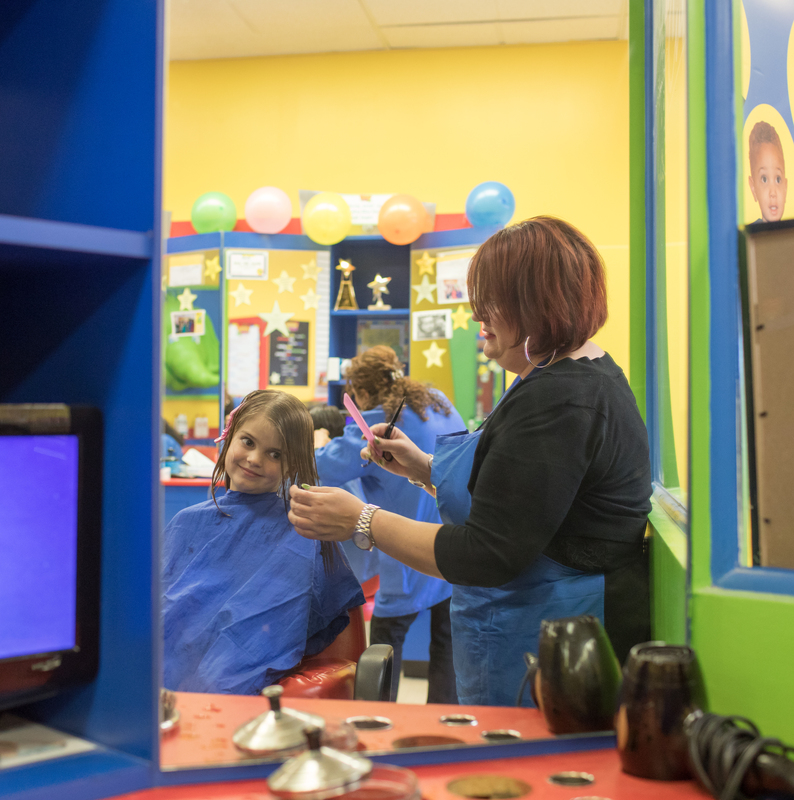 Cartoon Cuts has generously offered a free haircut to one of my readers! 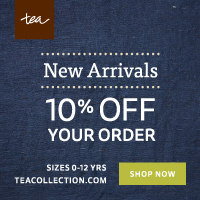 Simply comment on this blog post for a chance to win. I’ll draw a winner next Monday, April 3rd. Good luck! 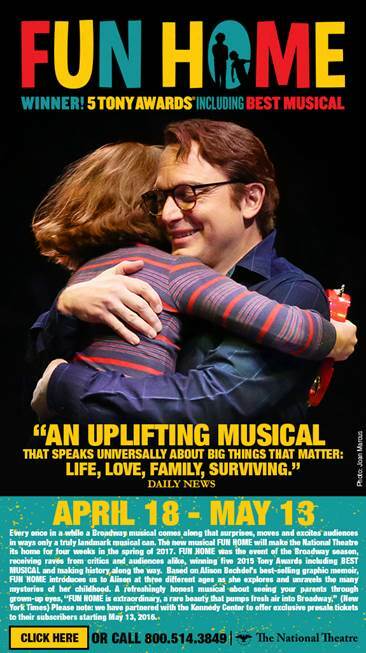 Enjoy a Parents Night Out at Fun Home showing at The National Theatre + GIVEAWAY! Do you need a night out without the kids? Then this giveaway is for you! I have 2 tickets for the grand opening night, Wednesday, April 19that 7:30pm up for grabs! Just leave a comment on this blog post to enter. I’ll draw and notify a winner on March 29th. Good luck! We are thrilled to offer you an exclusive discount to the first ten performances of Fun Home at The National Theatre! Use code KEYS to save more than 30% on select seats! Ringling Brothers and Barnum and Bailey Says its Final Farewell – Witness the Greatest Show on Earth One Last Time!! RINGLING BROTHERS IS A PLACE WHERE FAMILIES CAN CREATE MEMORIES THEY WILL CHERISH FOREVER – DON’T MISS YOUR OPPORTUNITY TO SEE THE SHOW BEFORE THE CIRCUS SAYS ITS FINAL FAREWELL! Playing Verizon Center March 31-April 2 and Eagle Bank Arena, April 7-16th. Get your tickets today at Ringling.com. Also, don’t forget to enter my giveaway to win a family 4-pack of tickets to see the show at the Verizon Center on Friday, March 31st at 7:30pm. Enter on this blog post here. The giveaway is open through March 19th. Good luck! 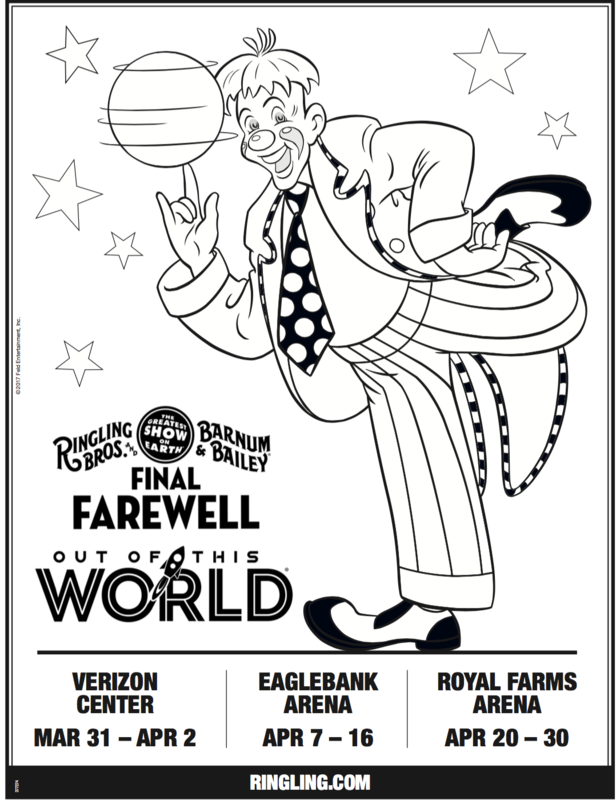 And here’s fun coloring sheet to print out for you kids to get them excited for the circus! Photo courtesy of Encore Stage & Studio. My oldest daughter Clara and I always look forward to our momma/daughter theatre dates at Encore Stage & Studio. Last weekend we saw a performance of their latest show – A Night at the Wax Museum. 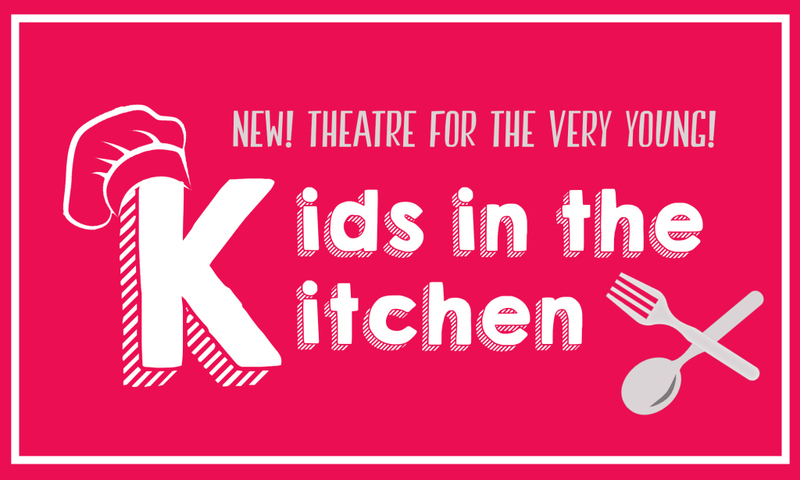 This theatre company that is “for kids, by kids!” is always so entertaining and this production was no exception! 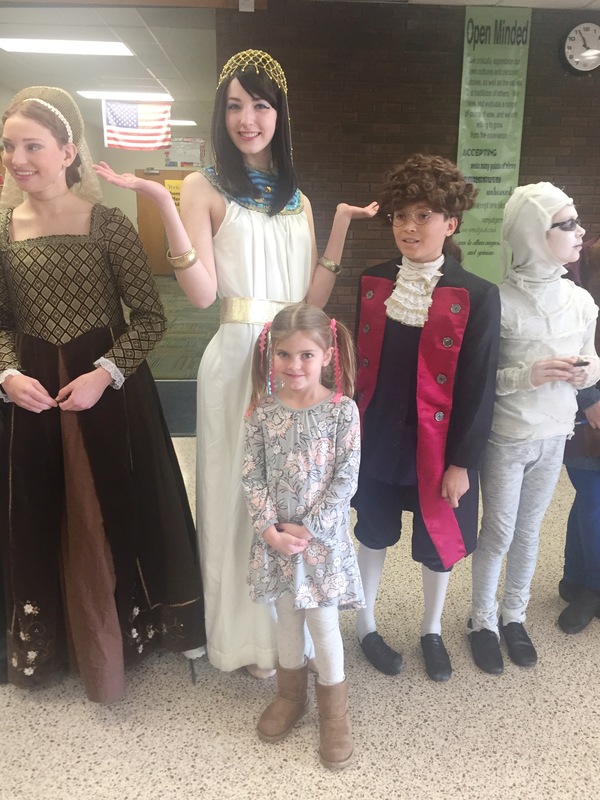 For six students, class is back in session when they take a summer school trip with their teacher to the local wax museum to help preserve the past. 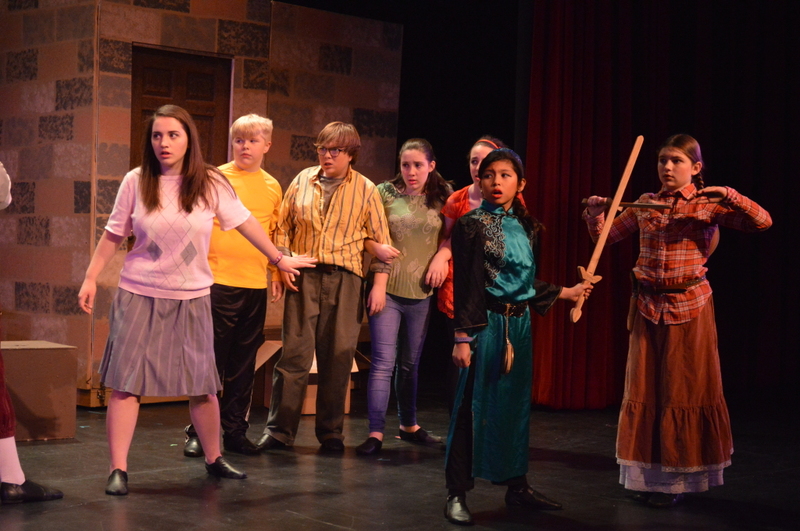 Between a hilarious love triangle involving Cleopatra and Henry VIII and a widespread hunt for buried treasure with Blackbeard and Butch Cassidy, it will be a trip for the history books! •The show is recommended for ages 6 and older. •Ticket prices: $15 adults, $12 children, students, seniors, and military. You can purchase tickets online or at the door. •The shows last approximately 1 hour and 45 minutes with a 15 minute intermission. 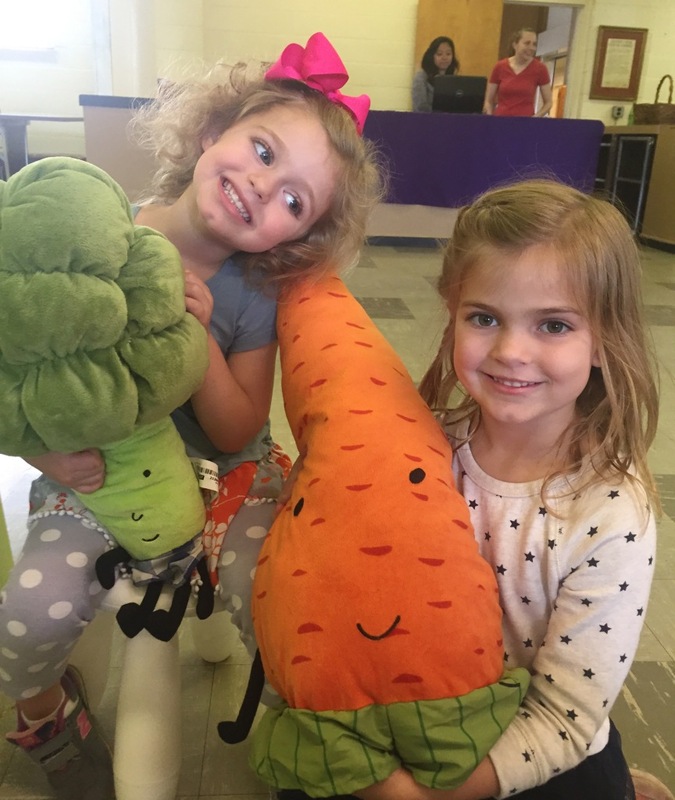 Ringling Bros. and Barnum & Bailey – Out of this World + GIVEAWAY! Ringling Bros. and Barnum & Bailey® is Bringing the Out Of This WorldTM Circus Experience to Washington, D.C. Area. Families in Washington and Fairfax can See Ringling Bros. One Last Time Before the Touring Circus Closes Permanently in May 2017.
Who wants to see the circus one last time before it closes? I am giving away a family 4-pack of tickets to see the show on Friday, March 31st at 7:30pm at The Verizon Center. For a chance to win, just leave a comment on this blog post. The giveaway will run through March 19th and then I’ll notify a winner shortly after. Good luck! Washington, D.C. – [March 6, 2017] – Prepare to see the most extraordinary performers and exotic animals one last time when the ultimate circus spectacle Ringling Bros. and Barnum & Bailey Presents Out Of This WorldTM comes to the Washington, D.C. area. 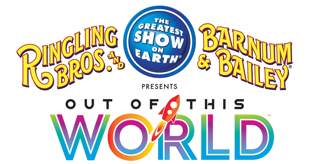 Ringling Bros. and Barnum & Bailey Presents Out Of This WorldTM features an immersive circus experience that takes families to space to witness incredible acrobatic performances on different planets. Ringling Bros. and Barnum & Bailey Presents Out Of This WorldTM is coming to the Verizon Center in Washington March 31 – April 2 and the EagleBank Arena in Fairfax April 7 – 16. Out Of This WorldTM will also perform at the Royal Farms Arena in Baltimore from April 20 – 30. For the first time, the show features thrill skaters in addition to unbelievable performances by gravity-defying acrobats, majestic animals and hilarious clowns. Imaginations will run wild throughout the nonstop display of artistic athleticism, with acts seamlessly transitioning from floor to air to ice, a feat never before done in Ringling Bros.
Tickets can be purchased at all Ticketmaster outlets, by phone at 800-745-3000, via www.ticketmaster.com, and at the Verizon Center and EagleBank Arena box offices. My oldest daughter and I have been enjoying Encore Stage & Studio performances for a couple of years. Theatre was something I introduced her to when she was just a toddler and she has grown to really love and appreciate it. We always look forward to our momma-daughter theatre dates. 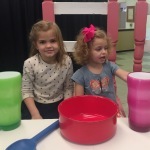 Now as Encore launched a new series for younger children (ages 1 and up) I was able to also introduce my youngest daughter to their theater as well. 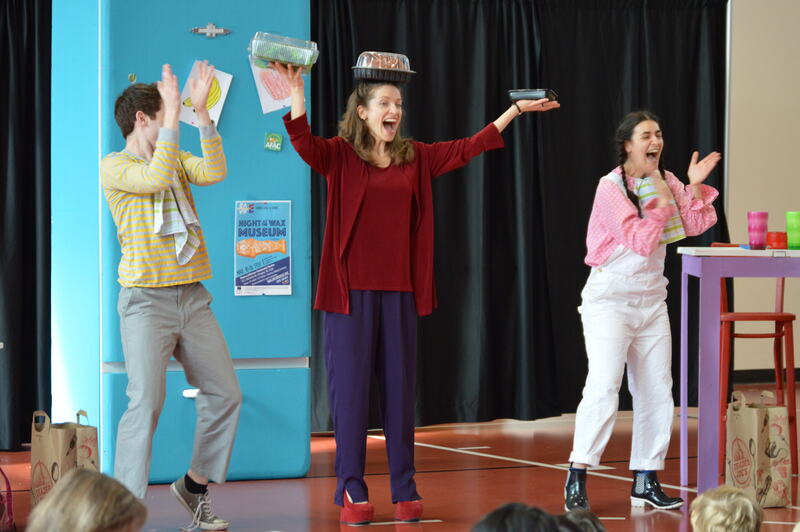 Last weekend we saw a performance of Kitchen Adventures, the first show in the new play series for preschoolers. 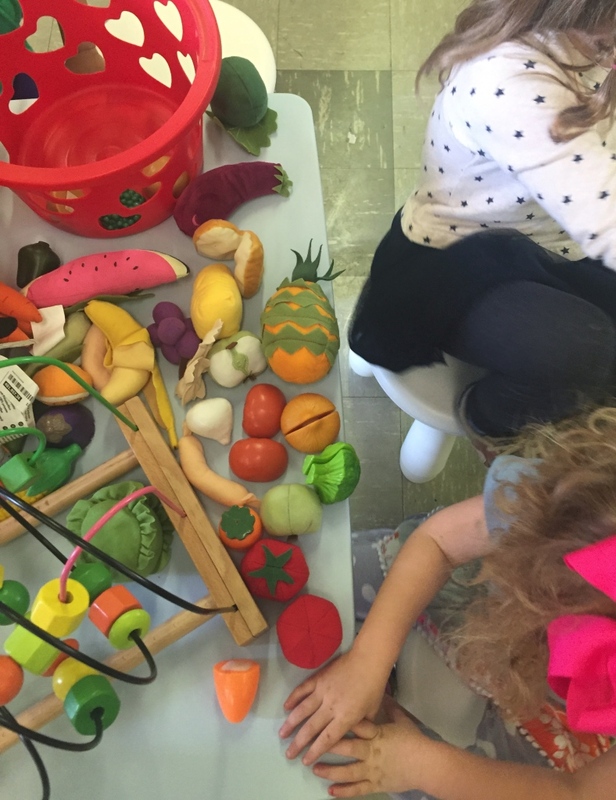 When we first arrived there were a couple of tables of healthy foods for the kids to play with and interact with each other. 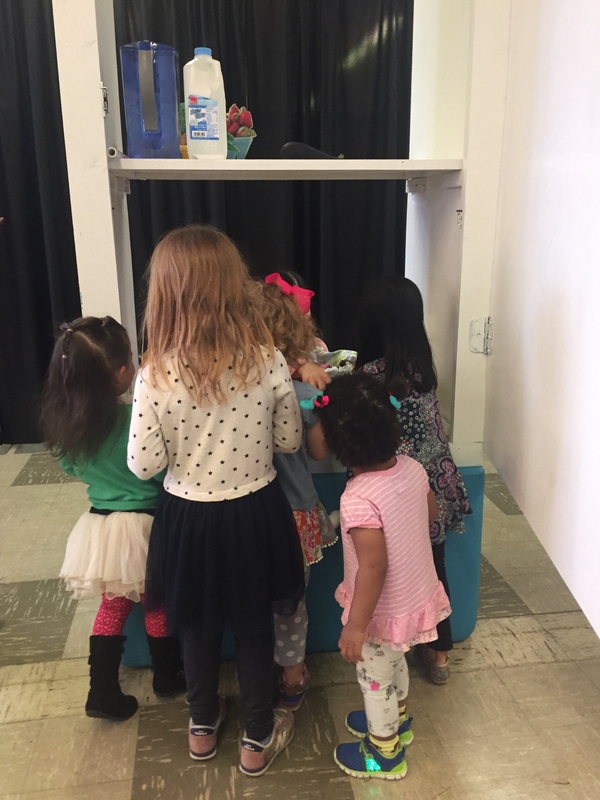 It was a great little spot to help the kids get some energy out before the show. 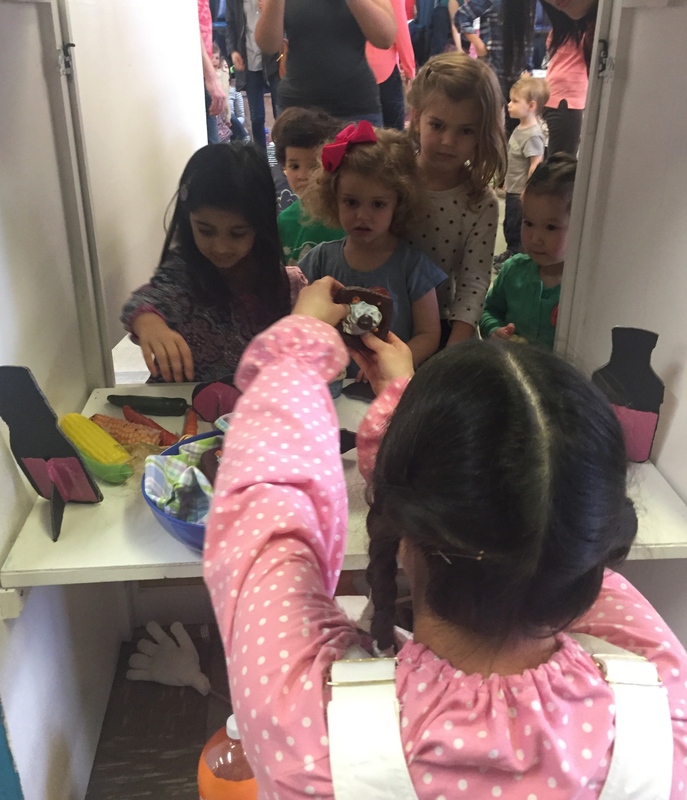 The show was held at St. Andrews Episcopal Church and it was an intimate setting designed to make small children feel comfortable and also a part of the interactive performance. Bright colored carpets were placed right in front of the stage area where kids sat front and center for the show. There was space to move around and snacks and drinks were completely acceptable too. It was definitely designed with the comfort of the kids in mind. The show was mostly non-verbal, there was no speaking just sounds but it really captivated the children and they watched intently. 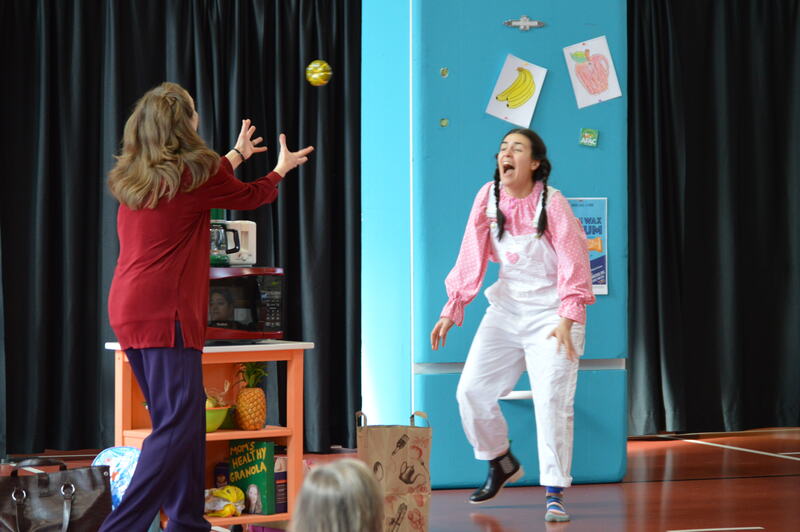 The actors were silly and brought a “tablespoon of fun” to the theatre experience. The show lasted about 30 minutes so it was the perfect length for the little ones. 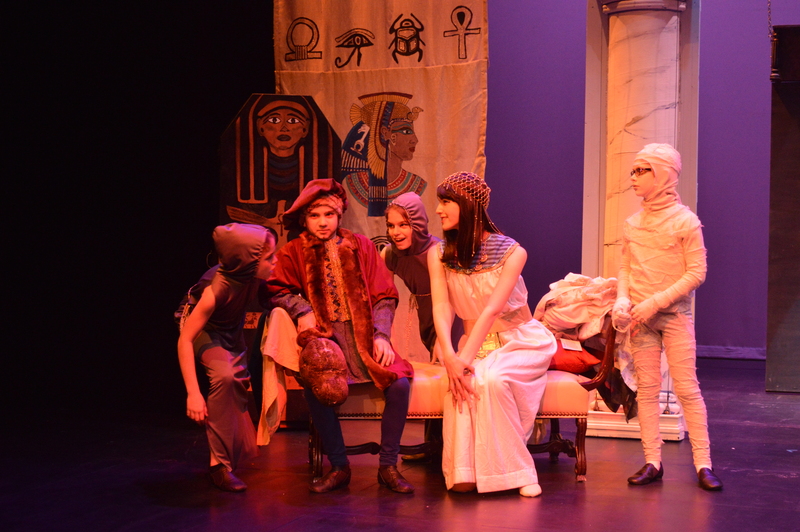 After the show, the children were invited up to the stage to explore the set and props and interact with the actors. 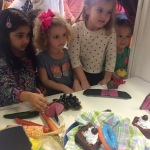 My girls were excited to take a look into the giant refrigerator and sit at the table. 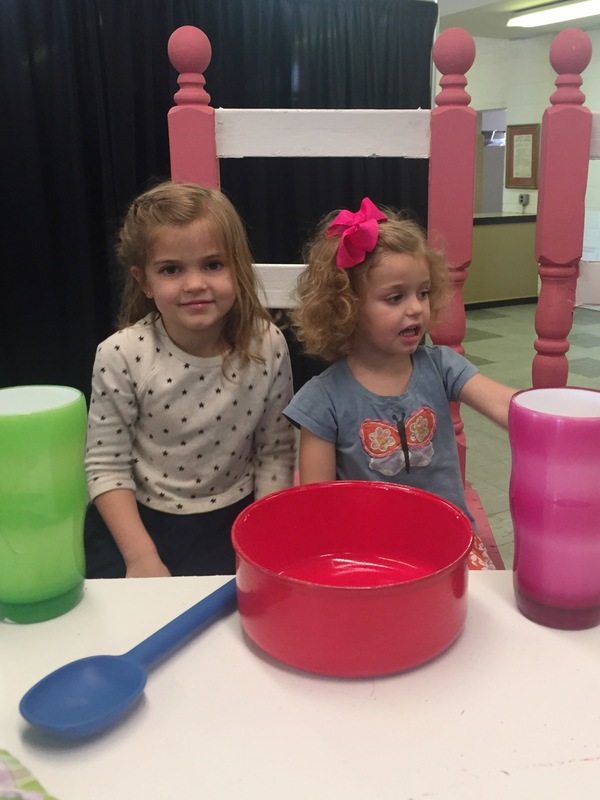 I can’t wait to see what Encore offers next in their new Theatre for the Very Young series! Kitchen Adventures was such a fun and cute show. I definitely recommend checking out the next performance. Tickets are just $10. 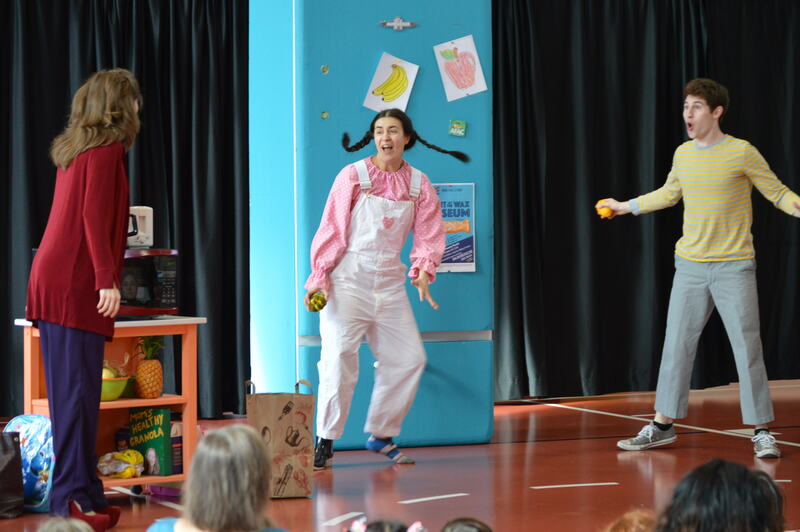 It’s a great way to introduce your little ones to the magic of live theater!